There are many things I want my children to have. As they grow, I hope they have fun, enjoy a variety of experiences, and can have a childhood they love. To provide them with such a childhood, Jenny and I are willing to sacrifice. We can earn more money to buy more things, go without for ourselves in order to provide more experiences, and forgo some of our dreams in order to provide for our children. However, I don’t want my children to have everything. While I want them to have a lot, I don’t want them to have every experience, every toy, every opportunity, or every desire of their heart. 1. This world is not about them. A child must learn the balance between feeling a true sense of self-worth, but also understanding the world doesn’t revolve around them. They are important, but they aren’t more important than everyone else. 2. They are part of something bigger. They are part of a family. In a family, individuals are important but the needs of the individuals must be submitted to the good of the whole. Sacrifice is necessary, but everyone is required to sacrifice. They won’t get to have every experience or go to every practice or make every event. Just as we will sacrifice for them, at times they will sacrifice for us. They must experience, even at a young age, the price tag of being in a good family. The benefits far outweigh the costs, but costs do exist. Within the structure of family, Jenny and I are not willing to sacrifice our marriage for their experiences. We will live busy lives, but we will not ignore one another just so they can play or be in every extracurricular activity. We place our marriage above their activities because they need us to be happily married. It is far more important that their parents love one another than that they have every experience possible. 3. Life can be good even if you don’t get everything you want. Kids must learn to process disappointments. It is far better to learn these lessons while they are still in my house than to experience them on their own. While I don’t have to invent ways for them to be disappointed, I also don’t have to rescue them from every disappointment. If kids are always getting what they want, they will likely assume happiness is the result of life going exactly as I desire. 4. We have different priorities than others. I want my kids to understand different people/families have different priorities. I don’t want them to judge others because they live differently than us, but I do want my kids to learn to make decisions based off of our values. While every kid in the class might get a stuffed animal for Valentine’s Day, I have no problem with my children not getting anything. Even though every other kid gets something, it will not kill them to be the one child with nothing. Teaching them that we shouldn’t waste money on pointless things so that we can spend money on more meaningful experiences is worth a few tears when they feel left out at the end of one school day. 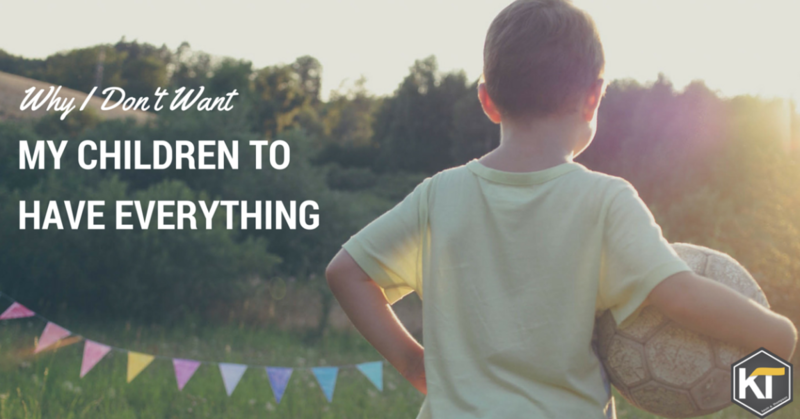 If my children have everything they want, they will likely believe the only value in life is to get what you want. I would prefer they have a higher value system than that. It is a natural desire for a parent to want to give their children everything possible. While it is an understandable desire, it’s one which must be rejected. Give your children many things, but don’t give them everything. They will thank you later.